What is the The Nobel Prize and who was the founder? How does it differ from the Nobel Peace Price? If you have the questions, here we have the answers. Alfred Bernhard Nobel (above center) was born 21st of October, 1833 in Stockholm, Sweden, a third son of Immanuel Nobel. St. Petersburg, Russia, where his father, set up a machine shop where they produced torpedoes. At an early age, Alfred worked in his father's shop and gleaned from his father's knowledge. Early on, Alfred showed an interest in the sciences, languages (naturvitenskapelige språk) and literature. It was easy for him to learn, but he never pursued degrees at any schools or universities. Eventually, he became known as a chemist, engineer, inventor and philanthropist. At the end of his life, he held 355 working patents for his inventions. In 1863, he moved back to Sweden and began working as a chemist at his father shop in Helenborg where he continued the development of the explosive Nitroglycerin and began to produce it for distribution. In 1864, he obtained a patent for a explosive material he named, Dynamite, after developing it one year earlier. The discovery and development of Dynamite had a great impact and positive reaction in many countries. This would mean great possibilities in developing new land and creating new businesses around the world. This was the base for Mr. Nobel's great wealth. In fact, my own father used dynamite to develop new land on our farm in mountainous Norway, known for its enormous quantity of rocks, such as granite and other kinds including what we in Norway call gråstein, which we have plenty of, I might ad. This original formula for Dynamite was gradually replaced with Gelatine-dynamite, which was/is a much safer material to use. Mr. Nobel had an important part in that development as well. Alfred also had strong social interests and his desire was to further the good for mankind. His dream and ambition was to serve people everywhere. As a result, he set up a fund, which is called the Nobel Prize and he gave most of his fortune to this foundation. 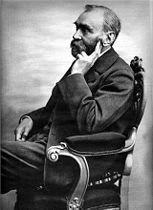 This is a famous quote by Alfred Bernhard Nobel: "I am not aware that I have deserved any notoriety, and i have no taste for its buzz"
The proceeds from his investment fund were to be awarded to persons who had made outstanding contributions to mankind the previous year. This event was to take place on the anniversary of the founder's death. He passed away in San Remo, Italy, December 10th, 1896, at the age of 63. Since that day, the Nobel Prize has been awarded every year to persons who has showed work of superior excellence in five main areas, namely in the fields of Chemistry, Physics, Medicine, Literature and in the works for the advancement of peace in the world. Mr. Nobel's intention regarding the third stipulation. This is the most prestigious award in the world and needless to say, a much sought after prize. It consist of a medal, a diploma, and a sum of money, of over one million dollars. But the paramount honor of the award is more prestigious and revered than the moneytary worth of the award itself. The Norwegian Nobel Committee/Den Norske Nobelkomite is in charge of handing out the Nobel Peace Prize Award and all the events, which has taken place in Norway's capital city, Oslo, since 1901. The Peace Prize Concert (Fredskonserten) held in Oslo, is also part of this event, where many international dignitaries attend. The Nobel Founder's Committee (Nobelstiftelsen) is in charge of awarding the winners of The Nobel Prize, in the fields of Chemistry, Physics, Medicine and Literature. This event takes place in Mr. Nobel's home country, Sweden, in the capital city, Stockholm. The Nobel Peace Prize monetary award is generated from the proceeds of the original investment donated by the founder of the Nobel Prize, Alfred Bernhard Nobel.